I’m one of those authors that enjoys the writing and that euphoric moment when you pull the author copy out of the package and hold the fruits of your labors in your hands. I don’t agree with the last part of Elizabeth George’s quote, though. For most writers, that isn’t the end of the job. There is still a great deal of work to be done promoting your book. It is, however, the transition from a solitary work shared only with your editor (when said editor can take a few minutes away from laughing maniacally and sharpening red pencils with a switchblade*) to something your cadres of adoring fans can enjoy. Some of the real fun of being an author happens during the writing. That moment when you sit back and realize you’ve crafted the perfect sentence. When you figure out how to resolve that nagging inconsistency in the backstory. When you catch your botched pluperfect before the aforementioned editor sees it. For us extroverts, though, most of the fun happens after the book hits the streets. We love standing in front a roomful of people to read our work, sitting at a book signing table with a line of fans in front of us, seeing our tweets shared far and wide. Yesterday, I got to experience a joyful moment in the gloaming, that brief period between the arrival of the first books and the start of the hectic marketing campaign. Almost a year ago, while working on Who Pooped in Central Park, I realized that I needed the kids to encounter a bird expert in the park. I toyed with different ideas for the character until I was struck with an epiphany: I know the perfect person! 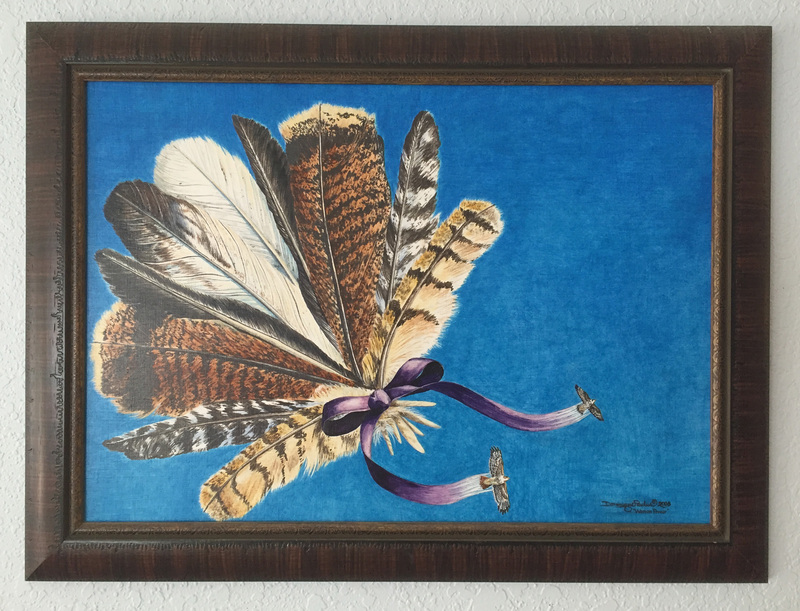 Dominique Paulus is an artist who paints, among other things, birds. We have one of her original paintings hanging on our living room wall (“Woman Power,” seen at right). She’s been my friend for years, and we’ve chatted quite a bit about birds when she’s in my bookstore shopping for bird books. 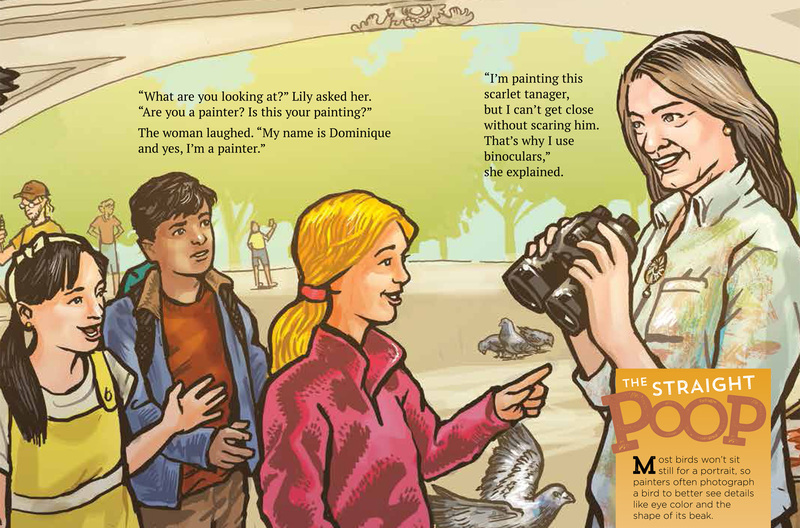 So I wrote Dominique into the book and had her spend several pages telling the children about the birds in Central Park. I sent my illustrator (the incomparable Robert Rath) a photo of Dominique and she became a part of the plot. I couldn’t resist hinting to her that I had a surprise coming, but I did somehow restrain myself and not tell her what I’d done. Yesterday, on the official release date of the book, I gave her a copy of the book and showed her the pages that featured her. Things that may seem minor to us, like a dedication or acknowledgement in the front of a book, mean a lot to people. Watching Dominique’s face when she saw herself in this book was a wonderful thing. As writers, we have many ways to change people’s lives. It’s up to us how we use them. * To Will Harmon, my editor at Farcountry Press: I’m sure you don’t actually sharpen your red pencils with a switchblade. I’m guessing you use an axe. The next Who Pooped book – the California Redwoods! Last month, I finalized the manuscript for my 19th Who Pooped in the Park book, which will be called Who Pooped in the Redwoods. 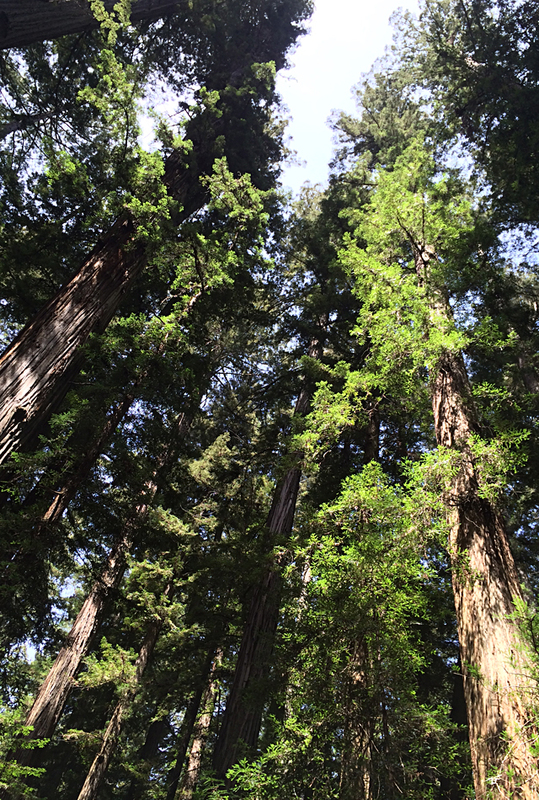 I took this picture of a redwood grove in Hendy Woods State Park during the research trip. Our intrepid regulars, Michael and Emily, will be hitting the road with Mom & Dad to visit Redwoods National and State Parks in California. Along the way, they’ll meet up with a host of critters, some of which we’ve met in other Who Pooped books, and a few new ones as well, like mountain beavers, fishers, tree voles, and ringneck snakes. This is a section of the manuscript for the Redwoods book. When I had the manuscript done, I had two people proofread it before submitting it to Will Harmon, my editor at Farcountry Press, who went through it with a fine-toothed comb. He found a few issues, and I fixed most of them right away and argued with him about a couple of others. He does tend to be right most of the time, but I still win sometimes! Each book is exactly 48 pages long. I put a lot of time and thought into arranging the story so that there will big beautiful color pictures, including two-page spreads, illustrating everything the family finds. But it takes illustrator Rob Rath even longer to actually draw those pictures. As I write this, Rob is sketching up his rough drafts for all of the pages. When he’s done, those will go back to Will, who will check everything carefully and then send it to me. I will look at all of the animals, scats, tracks, plants, and other content to make sure it matches the text and accurately reflects what that area looks like. And that doesn’t even count the plants! Not to mention the fact that Rob has a tendency to sneak one or two of his favorite critters into the background here and there, which makes it even more fun. Will and I probably won’t find much during our proofing pass – this is the 13th book Rob and I have done together – but there will likely be a few little things. Once Rob has made any required changes, he’ll do the final drawings and color everything. Then the book goes through one more proofing pass, which will involve a few more sets of eyes. The bar codes will be added to the cover and everything will be finalized. That’s when the book is sent out to be printed, which takes even more time. By the time the book hits stores, it will have been almost a year since we started. I hope you’ll find it worth the wait!